Comments: Since every Disney movie grosses 300 million dollars nowadays and becomes an instant classic the minute it hits the screen, most people who grew up in the 90's or the 2000's would probably assume that it has always been that way. Yes, if you grew up in the past 25 years or so, I am guessing you probably assume that Disney has always been a monster. And that their movies have always been the best of the best. And that Disney has never had a problem cranking out one hit movie after another. Well, that perception is fun, but unfortunately it would also be wrong. Disney was a wasteland when I was a kid. They weren't producing anything even remotely memorable. I know how astounding that will sound to anyone who didn't grow up in the late 70's/early 80's, but it is true. Between about 1972 to about 1988, Disney was practically as nonexistent as nonexistent can be. They weren't on anyone's radar as a great moviemaking studio anymore. In fact, when I was a kid, I remember the perception of Disney was that they were great back when they were making Mary Poppins and Snow White and the Seven Dwarves. But they had been coasting by on that reputation for nearly 20 years. And that Disneyland was just a big tribute to the kind of movies that they USED to do. If you go back and look at the kind of movies that Disney was cranking out in the 1970's, you will see a ton of nothing. It is just one forgettable live action kid's movie after another. Some of them were minor hits. Some of them just faded directly into obscurity. Some of them I see the title now and I don't remember a single thing about them. But you will be shocked when you see how obsolete Disney was for nearly a decade and a half. It wasn't until Beauty and the Beast and The Little Mermaid came around in the late 80's that they really sort of made a comeback and became relevant again. In my opinion there were only three significant Disney productions during that 15 year time period of the Disney wasteland. There was the Fox and the Hound, which was memorable but was probably too sad to be all that beloved. There was The Black Hole, which I personally loved (and I might write about it later) but which is now known as probably the biggest flop in Disney history. And then of course, there is my favorite. 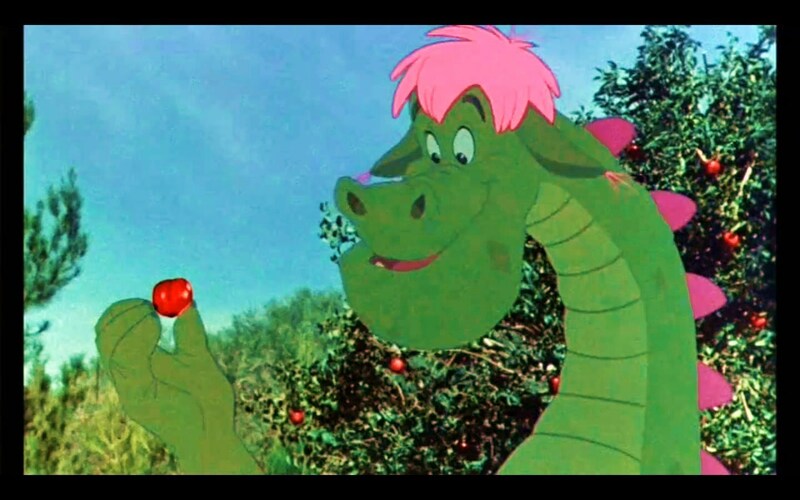 Pete's Dragon from 1977. In my opinion Pete's Dragon is the one really good movie from that whole era of the Disney wasteland. It is my favorite of the three big Disney movies of the era, yet for some inexplicable reason it is the only one of the three that has sort of been relegated to the garbage can of history. Nowadays it is almost unheard of for people to even REMEMBER that it was a Disney movie. Let alone be able to tell you how good it was. First off, I have to admit that Pete's Dragon was the very first movie I ever saw in a theater. My mom took me to see it when I was four years old. And needless to say, since I grew up to be such a big movie buff this was kind of a big deal. You never forget your first movie. Especially when you watch and think about movies as much as I do. 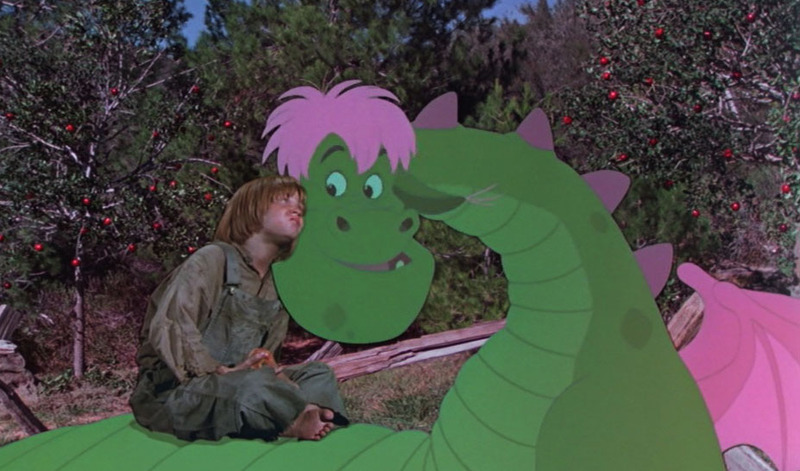 Pete's Dragon has always had an enormous impact on my life because it was my first. I can't tell you how many times I saw this movie when I was a kid. Whenever my family went to the video store and we rented a VCR (remember, this was 1980, back then you didn't rent movies you had to rent the VCR too!) I always talked my parents into renting Pete's Dragon. Oh, how I loved it. I remember I had the soundtrack on vinyl, I had the read along storybook, I had the toys, I had the board game, I had the Viewmaster cartridge. I had everything. The way that a lot of people nowadays feel about Toy Story, well that's how I felt about Pete's Dragon. It was the absolute center of my childhood movie experience. It also has Mickey Rooney overacting like an idiot. Which is always fun. 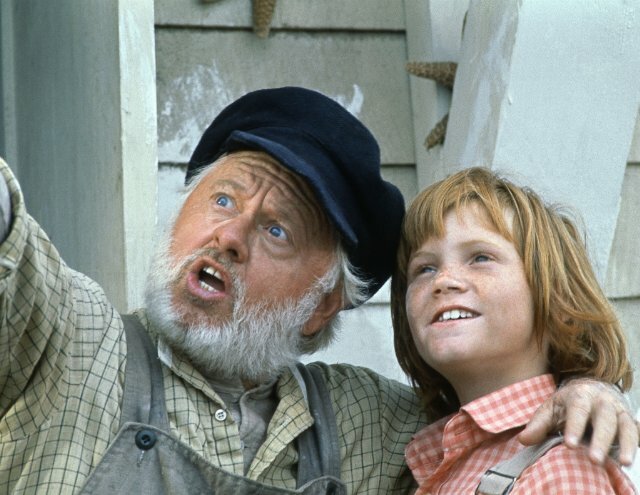 Pete's Dragon came out in 1977 and it was a pretty big hit for its time. Audiences were amazed at its combination of live action acting and animation, which remember, at that point in history, really had only been successfully done in a handful of movies. Mary Poppins and Bedknobs and Broomsticks are the two big ones I can think of. But by 1977 animation techniques had come a long way, and when Pete's Dragon came out it was considered to be a technical masterpiece. You watch Pete's Dragon now, and you think that actors interacting with a cartoon is no big deal, but you have to keep in mind when this movie came out. In 1977, from an animation point of view, the effects in this movie were as impressive as Star Wars. Remember, Who Framed Roger Rabbit (which admittedly did the exact same type of visual effects, only better) didn't come out for more than a decade. This type of shot was practically impossible in 1977. Yet Pete's Dragon did it. Pete's Dragon had amazing special effects for its time. It had amazing songs for its time. Again, this has also sort of been forgotten by history, but there are about ten great songs in this movie. In fact I would say there are as many memorable songs in Pete's Dragon as there have ever been in any Disney movie. And yes that includes Mary Poppins. One of the songs in Pete's Dragon (Candle on the Water) was even nominated for an Academy Award. Does anyone ever remember that? Of course not. But here is the thing about Pete's Dragon. Yes, it had great special effects. Yes it had a really good soundtrack. Yes it had an appealing lead actor (Sean Marshall). But those aren't the things that I think of when I think of Pete's Dragon. Nope. This movie had all of those things going for it, I would have recommended it to you just for the animation and the music alone, but they were NOT my favorite things about Pete's Dragon when I was a kid. 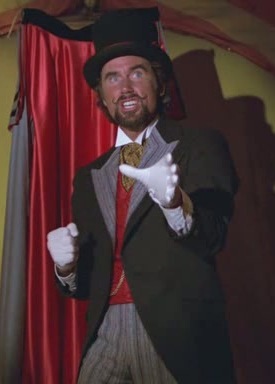 Jim Dale as Doc Terminus. My favorite Disney villain ever. Ah yes. Doc Terminus. The greatest Disney villain of allll tiiiiiiime. Seriously, if there is one reason you should watch Pete's Dragon, it is for the villains. Or rather, should I say, the hammy overacting villains. Because there may have never been a movie with more hammy over the top scene chewing villains than Pete's Dragon. Jim Dale is my favorite of the villains. His work as Doc Terminus is so over the top and broad it is like looking at the Mona Lisa. I remember just being entranced watching him when I was a kid. Even though he was supposed to be the bad guy he was always my favorite character in the movie. 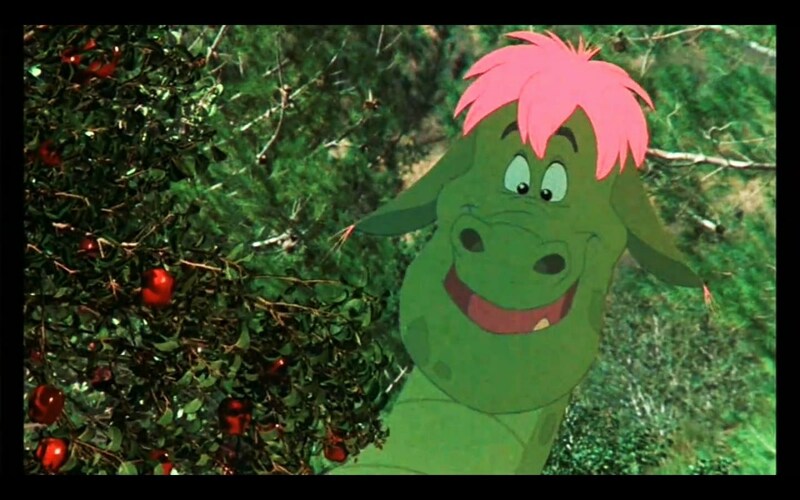 I would just sit there and watch Pete's Dragon and wait for the scenes where Jim Dale would show up. Even as a kid I could tell he was having so much fun. 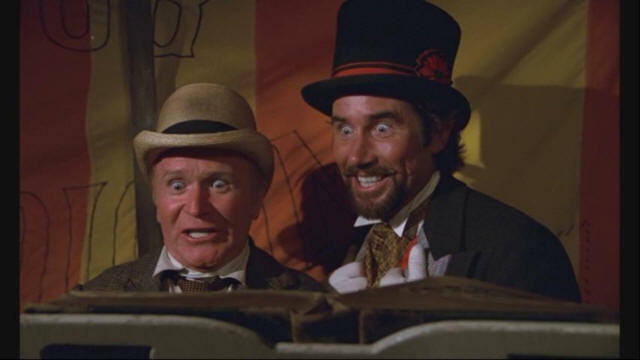 Red Buttons and Jim Dale performing my favorite song in the movie, "Every Little Piece." Pete's Dragon is chock full of actors hamming it and trying to overact one another. Again, remember, this movie stars Mickey Rooney. Mickey Rooney has always been the definition of broad overacting. And again, don't forget this. This will haunt your nightmares. Mickey Rooney. Jeff Conaway (from Grease). Shelley Winters. Red Buttons. Not a subtle nuanced actor among the bunch. It is just one big overacting cheese festival with everyone trying to be the broadest. It is like watching a Chris Farley festival. But again, no one beats Jim Dale. 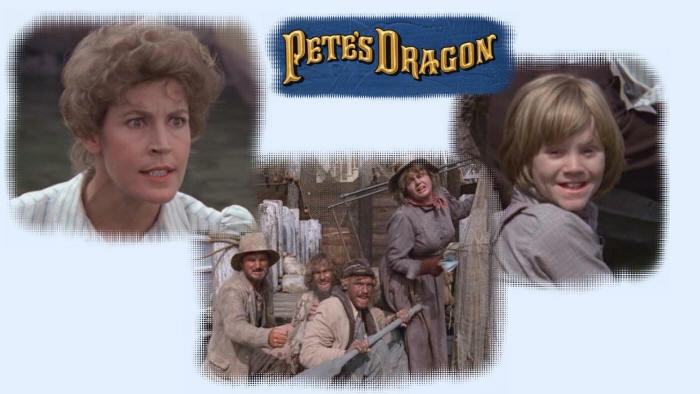 If Pete's Dragon were a Murderer's Row of hammy overactors, Jim Dale would be the Babe Ruth. I really think he should have won some sort of an award for this. Jim Dale and Red Buttons. The stars of the movie. In short, Pete's Dragon isn't the greatest movie in the world. Some of the effects don't hold up that well nowadays, most of the acting is broad and as cheesy as hell, and at two hours long it is way too long for a children's movie. But man, the stuff that is fun in the movie is REALLY fun. I just watched it the other day for the first time in like fifteen years, and I was surprised to see how awesome the soundtrack still is. In fact, I currently have about eight songs from Pete's Dragon on my iPod. While I can kind of understand how the movie might have been forgotten by time, in no way will I ever understand how the soundtrack could have been forgotten. Pete's Dragon has one of the better soundtracks of any Disney movie. It is a shame that stuff like "Candle on the Water" and "Every Little Piece" and "Brazzle Dazzle Day" and (a personal favorite) "Bill of Sale" could have ever been forgotten. I am not going to sit here and tell you that Pete's Dragon is a masterpiece. I am not going to sit here and tell you it is better than stuff like Finding Nemo or Toy Story. However it is a lot better than most anything else that Disney was cranking out in the 70's and 80's. And it is sad that only people my age (mid to late 30's) seem to even remember it. It is one of those rare movies in the world that is both underrated and overrated. People my age who grew up with it and remember it as a milestone of our youth probably overrate it. And then everyone who sees it later and compares it to other Disney movies probably underrates it. I don't know. 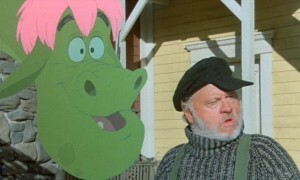 All I know is that I loved Pete's Dragon when I was a kid. And I watched it again a couple of days ago and I think it is a really fun movie. The soundtrack is great. Jim Dale is a trip. The Gogans steal every scene they are in. Mickey Rooney is ridiculous. And not in a good way, but at least in a fun way. It might not be the greatest movie in the world, but it never should have been a forgotten one. For 1977 this children's classic is absolutely magnificent. Beautifully cast - masterful songs - brilliant color and scenery. Disney couldn't have produced a more memorable, masterful musical than this one. 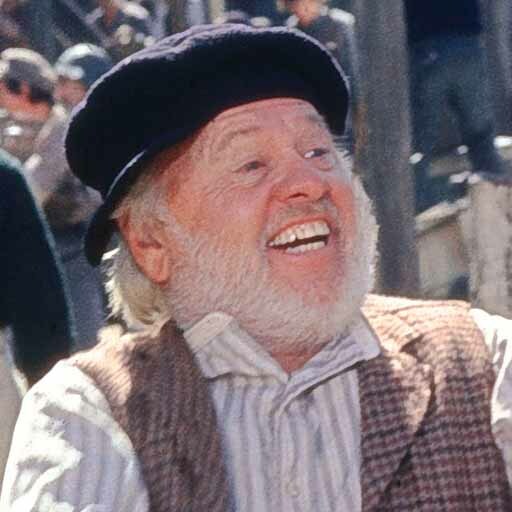 Mickey Rooney gives a fine, stunning performance as the comical, drunken 'Lampie' and is alloted full use of his veteran musical talents in 'I saw a dragon' - tripping about the saloon after a chance encounter with "Elliott". Helen Reddy is dandy as 'Nora', the unmarried daughter. And Jim Dale and Red Buttons are at their comical genius best as 'Dr. Terminus' and 'Hoagie' - especially in their performance of 'Every Little Piece', which I countered in connection with an off-Broadway musical style quality - of which the song could also garner a Tony. The Gogan's - I felt, almost stole the show - next to Elliott-the dragon. Their memorable hillbilly opener "happiest home in these hills" was brilliantly choreographed & performed. And actor Conaway is still remembered all these years later (outside 'Kenicki' in GREASE) as one of the bumbling, hillbilly brothers. I proudly own my own DVD copy, the org. vinyl, and my new CD. Sadly, Disney doesn't produce high-quality action-animation like this classic much more these days. Which makes appreciating this film as a work of art. Like many people, I am in the process of upgrading my collection from VHS to DVD/Blu-Ray. This was on-sale at Amazon. What a surprise! Much better than I remember it. Great songs and cast with great performances by Red Buttons and Mickey Rooney. Shelly Winters plays a wonderfully-horrible villain with "blackout" teeth. A simple story about a dragon that only Pete can see (at first) and clever dragon mechanical effects: Pete riding Elliott, toasting apples, dragon footprints, his "outline" on the schoolhouse wall, thrashing around inside a whale-sized net. The dragon animation by Don Bluth is fanciful, which is good because this is a children's' movie. Some technical glitches, as the "yellowscreen" (sodium vapor) process renders Elliott the Dragon somewhat transparent and prone to color-shifts. But this is not something that kids care about anyway. Although "Candle on the Water" is the Oscar-wining song, I bet you start humming "Brazzle-Dazzle Day" as the movie ends! Pete is a small boy running away from slavery with an abusive hillbilly family who have "bought" him. He falls in with an invisible dragon and a lighthouse keeper and his daughter, and assorted good and bad things happen. This Disney offering is one of the more forgotten live action movies despite the fact that it has quite a lot going for it. It is colourful, daft, has a good moral heart, some excellent villains, decent songs, and decent effects (both physical effects and traditional animation). The performances are all good, with Helen Reddy doing well in her only movie lead role, and young Sean Marshall's sincerity outweighing his winsome cuteness. I saw this movie sometime in the very early 1980s on TV, and I absolutely loved it. Then for all these decades I never saw it again until a week ago I requested it on DVD from our public library. I was allowed to keep it for a week (and sadly have to return it today). I watched it every single day of the week! This is one of the best movies ever made. It was filmed before the obsession of computer generated "realism" started. Instead of CGI, it relies on its performers, on music, on pure photography, and, for the dragon himself, on a cartoon. All of them were topnotch back then and still are topnotch today. The main character, Pete, is played by a multi-talented twelve-year old Sean Marshall who has to be one of the best twelve-year-old performers I have ever seen (and I have seen quite a few as I have lived in a number of very different countries in my more than half a century). This kid has an amazingly powerful voice. His facial expressions can show so many emotions. He can carry any tune in his singing. He has a wonderful sense of rhythm, whether in the way he sings and dances, or in the way he talks and walks. How any of the reviewers below can be critical of this talented young man (yes, really, at twelve he had the full talents of a grown-up man!) is beyond me. This movie is amazing. The only bad thing about it is that I have to return it back to the library already! "Pete's Dragon" is an enchanting Disney tale that combines live-action and animation. The dragon is the only animated character, but that doesn't change the fact that this is a perfect combination of live-action and animation. This is definitely one of the best live-action movies produced by Disney. One of my favorites. It's cute and charming. It looks dated, but that's not a major flaw. Actually, that's part of its charm (which is timeless). There are plenty of beautiful vistas: a lighthouse, mountains, green places, the endless sea and more. Passamaquoddy is a strange name, but the village is nice. The dragon Elliott is cute and lovable. He almost resembles Puff the Magic Dragon and has a funny way to communicate. His sounds are awesome. Elliott is a good and innocent dragon, but big and clumsy. Pete is a cute and lovable kid. I enjoy his friendship with the animated dragon. There is a nice cast in the film. Sean Marshall is excellent as Pete - he is a very underrated former child actor. 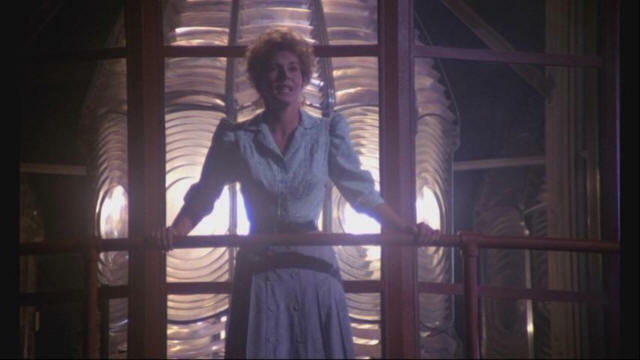 Helen Reddy is great as Nora. Mickey Rooney is funny as the silly but comical Lampie. Jim Dale is priceless as Doc Terminus. Red Buttons is very convincing as Doc Terminus's sidekick Hoagy. Shelley Winters plays well her role (the wicked Lena Gogan, the leader of the Gogans). This is an underrated film. Yet, it's a nice old-fashioned one. And nostalgic too because it's a reminder of other times and also of my own childhood. There are some cheesy moments, but nothing too serious or enough to ruin the movie. One of the few things I don't like about this movie is Pete's teacher. She is so mean, even more when she does that corporal punishment thing to Pete. Hoagy is one of my favorite characters. I don't consider him a villain. He's not a bad guy, he's just a poor devil who chose the wrong friend. He is hilarious even in his name. I don't know why, but 'Hoagy' sounds funny to my ears. Classic humor is another solid point of this movie. Many of Doc Terminus's lines are funny, as well as the fact that he never says "Passamaquoddy" correctly. About the songs, I like most of them very much. My personal favorites are "Brazzle Dazzle Day", "It's not easy", "Candle on the Water", "Boo Bop Bopbop Bop (I love you, too)", "There's Room for Everyone" and "Bill of Sale". These songs are great. Timeless classics. This motion picture is one among many examples of great underrated films. Many times I get more surprised with a less popular and less appreciated film than with one of those films that most everybody loves. It doesn't always happen, but most of the universally loved films end up being overrated and turn out to be disappointing because we create too much expectations on them, while a not so known and valued movie I may not expect that much from it but turns out to be a pleasant surprise. That only makes me respect and admire these less valued movies even more. "Pete's Dragon" is not the last Disney classic combining live-action and animation (although the dragon is really the only cartoon in it), but it's one of the last in the traditional sense. That is why it looks older than it really is. It's from 1977 but in many ways it looks like something from the 60's or even the 50's. This means that even in 1977 it already looked dated, an impression that is even stronger considering "galactic" movies like '2001: A Space Odyssey', 'Star Wars' and 'Close Encounters of the Third Kind' and "galactic" TV series such as 'Star Trek' and 'Battlestar Gallactica'. But being obsolete for its time isn't really a fault. It's just temperament. Actually, "Pete's Dragon" has a charm of its own. It's a timeless classic. This was one of my childhood films. Settings are authentic and owners of a great and natural beauty. I wonder if Passamaquoddy exists for real. Nevertheless, Passamaquoddy is one heck of a name. Not as difficult to spell as "Supercalifragilisticexpialidocious" (and by no means as difficult as to say it backwards, which is "dociousaliexpiisticfragicalirupus" but that's going a bit too far, don't you think? ), yet still a little difficult to pronounce at first. Takes its time to learn how to pronounce. But it's not as hard to spell as Doc Terminus wants to make us believe (ha ha ha). The dragon Elliott is cute and very friendly and sweet. If he was real, he'd make a wonderful pet. The kid is cute. What ever happened to Sean Marshall? He was both a very talented actor and a gifted singer. In other words, he was an authentic actor and singed like an angel. Speaking of music, this movie has immensely charming songs. "Candle on the Water" is soft and very relaxing. "It's Not Easy" is very touching and beautiful. "Boo Bop Bop Bop Bop (I Love You, Too)" is quite cute. "Brazzle Dazzle Day" is a feel-good and very optimistic song. "There's Room for Everyone" is another wonderful and nostalgic song. "Bill of Sale" has a different nature than all the songs previously mentioned, but it's just as great and memorable. Jim Dale is hilarious as the sly as a fox and corrupt Dr. Terminus and Red Buttons is priceless as his follower Hoagy. Hoagy is the typical Disney follower of a villain: mostly harmless, not truly evil or threatening, just a poor guy who made the wrong friend. That's real acting in both cases! Charlie Callas makes very well Elliott's sounds. Helen Reddy and Mickey Rooney are great too. The actors who portray the Gogans are quite convincing in their roles. The Gogans are dirty and creepy, they aren't nice and likable people, but there are moments when they're funny. Pete's teacher isn't a nice and likable person either, but the actress convinces in her portrayal. I rewatched this for the first time in almost 2 decades, and found it still holds up in many ways despite some technical glitches and weak jokes. I credit the film's watchabl-ness to the following; 1) Leisurely pace. The narrative is pulled off onto tangents by the wealth of talented actors in supporting roles. The director seems happy to allow them to do this, and it benefits the film. 30-40 minutes could easily be cut, and 3 minute scenes could easily be reduced to a single line of dialog - but where's the fun in that? Viewers who commit the time will get to see pretty much every actor interact, whether the scene is necessary or not (Buttons and Rooney, Dale and Reddy, etc.) 2) Catchy Songs. With a few exceptions, the songs in Pete's Dragon mostly reflect the quasi-lounge feel of Burt Bacharach numbers. Each number is mounted as a "showstopper," with dance and dialog breakdowns that contribute to the running time. However, unlike most modern musicals, the songs are integral to the plot. 3) Solid Ham in supporting roles. The veteran performers chew scenery like James Bond villains without ever failing to take the proceedings seriously. Winters especially gave me the creeps. Really, any scene with Doc Terminus is going to be a good one. Like one of the IMDB user reviews mentioned above, Jim Dale chews the scenery like he is a James Bond villain. But my favorite two scenes in the movie are his two songs: "Passamashloddy" and "Every Little Piece." That is Pete's Dragon at its best.